This is the earliest known photograph of the inside of St George’s Chapel, dating from the mid-nineteenth century [SGC PH C.93a]. 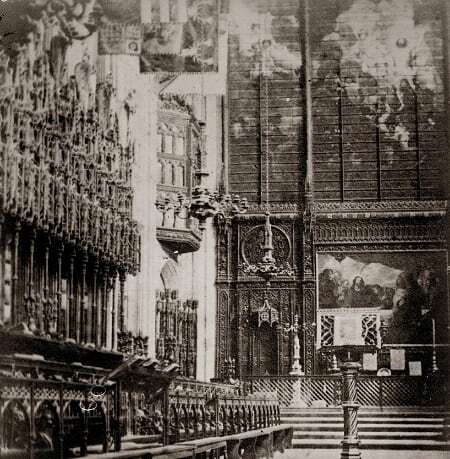 Although the east end is a familiar sight to many, this picture may look a little strange as the interior of the quire has since altered dramatically. In fact, many of the features shown are known not to have survived beyond the 1860s. An extensive Victorian refurbishment not long after this photograph was taken resulted in the creation of the present stained glass window and sculpted marble reredos, commissioned to commemorate the life of Prince Albert, Queen Victoria’s consort, who died in December 1861. The window shown here immediately pre-dated the Victorian installation but is not the original medieval stained glass. Rather it is the product of a late-eighteenth century programme of restoration ordered by George III to ‘update’ the look of the Chapel. The stained glass – seen as crude and limiting by most Georgian artists – was replaced with newly fashionable painted glass, which was expected to allow a more expressive style of artwork. Many panels of glass, painted with oils, were pieced together, replicating a painting by the king’s Historical Painter, Benjamin West. His design depicted the Resurrection, showing the risen Christ at its centre (the large, bright figure in the top right corner of this photograph), flanked by the three Marys approaching from the right and the disciples Peter and John running to meet him from the left. Unfortunately, painted glass quickly fell out of fashion, in part because it was difficult to apply enough paint to make an artwork visible without blocking all light. One early critic of St George’s painted east window described its installation thus: “Here is gained a transparent scenic exhibition and here is lost one of the finest terminations of a religious edifice the land could own…”  The Victorian era saw the destruction of a lot of painted glass, including this window at St George’s, which had been in place for less than one hundred years. The carved wooden reredos was also a work of the 1780s. The carving was executed by Henry Emlyn, a local carpenter-turned-architect who was also responsible for extending the stalls in the Quire and installing the Coade stone organ screen. 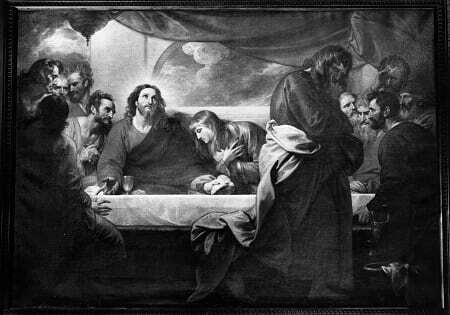 The large painting shown hanging behind the altar depicts the Last Supper, another work of Benjamin West. West was a favourite artist of King George III and became involved in his efforts to re-introduce artwork to the Church of England in the wake of seventeenth-century Puritanism. To make way for the Victorian marble, the carved wood was dismantled and the painting removed. It hung for several decades in the vestry and then the Chapter Library. We hold a black and white photograph of it from that time which shows some more of the detail [SGC PH PAI.14]. In 1978 it was sold at auction and passed out of the Dean and Canons’ ownership. One aspect of this Georgian east end survives in the College. The carved roundel that can be seen at the top left-hand of the reredos bears the coat of arms of King Edward III, founder of the College of St George, surrounded by the arms of twelve of his first Garter Knights. This and its pair – the arms of the Black Prince of Wales surrounded by those of the other twelve Founder Knights – now hang beside the door to the Clerk of Works’ tea room in the Curfew Tower. Carter, John, in Gentleman’s Magazine (1805), 2, pp. 924-6.